A couple of weeks ago I was very fortunate to receive these in the post. Sew and Sew by the Sea Sea had accidentally found herself in possession of two copies of these and so very generously offered to send them to someone who could use them. And I was the lucky one! 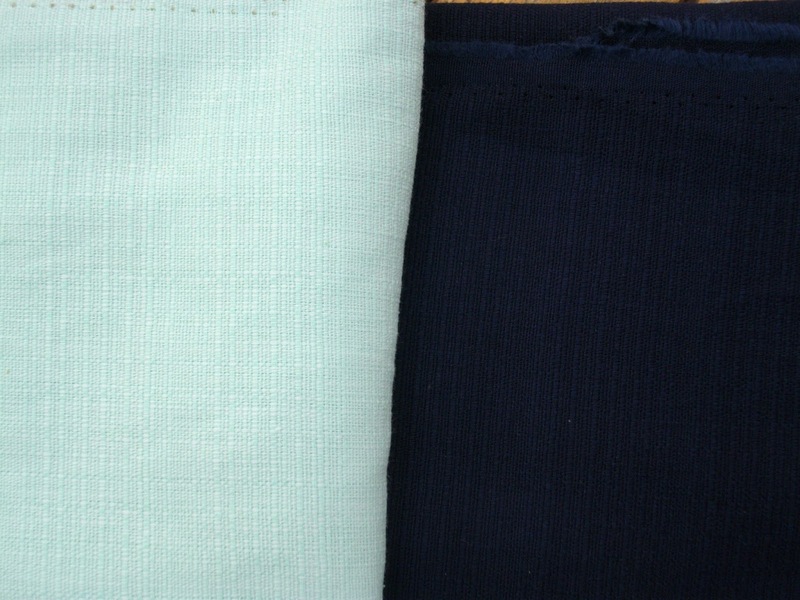 Then quite serendipitously my local fabric shop got in a huge range of solid textured cottons. And they were on sale for Songkran (New Year) which we’ll be celebrating shortly. 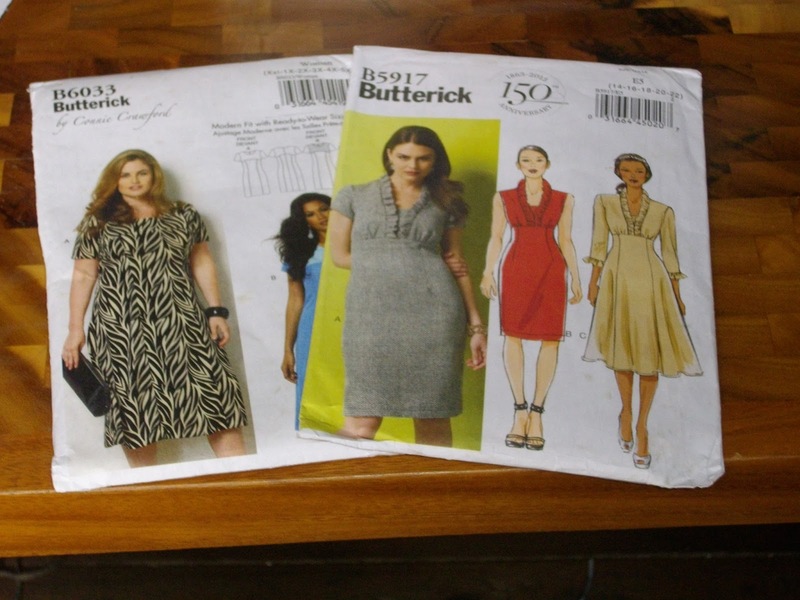 (more on that in another post coming soon) So I am making Butterick 6033 view B. As well as the contrast yoke I am also going to make the front and back centre panels in mint with the rest in navy. You can see the texture of the cotton better in this picture below. Although the mint isn’t the true colour. I don’t think. I’m not sure because I’m writing this on the back balcony (and laptop monitors and outside don’t always work so well) because it is 41 degrees celcius here today and at least there is a breeze on the balcony. I’m telling myself it’s a breeze – to be honest it is kind of a hot wind. So now I just need to contemplate how much (if any) contrast topstitching to use. Don’t forget to check out the very generous Sew and Sew by the Sea Sea. Well, I’m off in search of a beer. Have to keep your fluids up in the heat you know. Hope your plans are coming together for April and if you have any thoughts re where and how much contrast topstitiching I’d love to hear them. Your dress will be lovely in such a pretty color combination! I LOVE the mint/navy colour combo! I think contrast topstitching would be lovely, around the neckline and where the yoke meets the main body of the dress. If it was me, I'd probably go bonkers and add it to the sleeves and hem too, but I realise that's just because I like frivolity! I hope so. Can't wait to get started. I must admit I'm leaning towards more rather than less. I thought about doing the front panels too. And of course if I do the sleeves and hem I can machine stitch them. That's a win! Thanks very much. Here's hoping for a not too difficult fit and a straightforward sew. Can't wait to see your dress, I love the fabric. I'm so glad you are using the patterns and thank you for saying such nice things about my blog. Good luck with the heat ! Thank YOU so much for the patterns. Starting on the muslin today, so fingers crossed.